3 track 7″ EP…… This is a NWOBHM must!!! N.W.O.B.H.M. legend Burner. 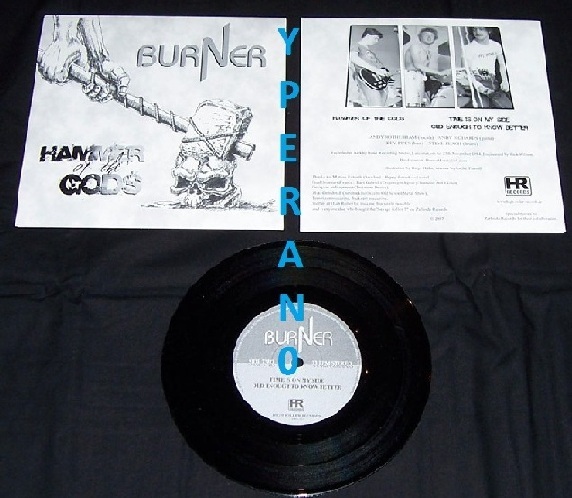 So far, Burner have just released two fantastic 7″ singles for Zerlinda Records: “Savage Killer” in 2002, followed by “Hammer Of The Gods” in 2007 (in co-operation with High Roller Records). The trio from Ashby-de-la-Zouch in Leicestershire, which is in the Midlands, is not a new band at all. Their history goes back to the very early ’80s, as drummer Steve Peach explains. If an album by Burner had been released in the early ’80s, who knows, the band might have been one of the leading lights of the New Wave Of British Heavy Metal movement. How comes Burner did not fulfil its potential? The band did not even appear on one of the many compilation albums back in the days … “Because we never really pushed ourselves to the point that you need to, to make it”, Steve Peach analyses. “We were offered a chance to get a track on a compilation album by Ebony Records in 1982, as they really liked Andy Rotherhams voice, but we were going through a line-up change on bass guitar which never worked out and we never took them up on their offer.” Burner even kept a low profile regarding the distribution of demo tapes, as Steve explains: “The only two demo tapes that we did are the two singles, savage Killer and ‘Lay Down Your Arms’ from 1982 and ‘Hammer Of The Gods’, Time Is On My Side’ and ‘Old Enough To Know Better’ from 1984. These were never official releases just sold at gigs with home made covers.” Live Burner played mostly in the Midlands. Leicestershire, Derbyshire, Nottinghamshire and Staffordshire were the most frequently played areas, where they played in pubs and clubs. Their biggest musical influences were Judas Priest, Iron Maiden, early Def Leppard and Black Sabbath. So really a mixture of N.W.O.B.H.M. and traditional Rock/Metal. Burner were yet another heavy British act to emerge from the Midlands, a fertile musical area which had, in the 70s, giventhe world Sabbath, Priest and Zeppelin. During the NWOBHM era, the likes of Witchfinder General, Cloven Hoof and Diamond Head would assume the mantle of these original metal pioneers, although minnows such as Burner also won favour with the regions more devoted and knowledgeable headbangers. Having started out as the Savage Dogs and decided they were going nowhere fast, the lads reeled in a capable frontman and reinvented themselves as Burner, purveyors of hard and heavy, Priest-influenced NWOBHM. After penning a variety of original songs, a couple of tracks (the awesome savage Killer’ and ‘Lay Down Your Arms’) were captured on cassette and touted around the minor labels, and, despite some highly encouraging words from Neat and Ebony, a record deal failed to materialise. In fact, they were unlucky not to be included on a compilation of up-and-coming bands at the time, something which would surely have spread their name to a wider audience. In the meantime, it was back to the grind and local gigging whenever possible, the attendant masses usually expressing genuine enthusiasm for such energetic material. Still, things didn’t run smoothly, with various axemen and bassists coming and going over the next couple of years, which also saw the outfit moving into rather more of a refined power metal style. A second demo was recorded late in 1984, although it again failed to propel the lads to stardom. Disenchanted with the cruel music business, Burner called it a day early the following year without having seen a solitary track immortalised on vinyl. The members drifted apart but continued to play in part-time acts for their own amusement, although their dreams of international recognition were now merely memories. That all changed around five years ago, however, when the band came into contact with a newly-established label (Zerlinda Records) who planned to release a series of 7″ singles from totally underground NWOBHM acts who had somehow been overlooked at the time. After some gentle persuasion, Burner agreed to make their material commercially available, and the gloriously-rough first demo was soon mastered and lined up as Zerlindas inaugural release. In an ideal world, it would have come out as a 20th anniversary single in 2002, but things were unavoidably delayed, so it ultimately hit the shops late the following year. Better late than never, we say, and a near-ecstatic reception from metal fans around the world is a glowing tribute to the strength of this archive material. The bewildered-but-delighted musicians have subsequently received requests for info and interviews, and their limited edition single has already become something of a collectors item. Now, after coming to terms with their belated popularity, Burner have made their second demo available for public consumption, and a High Roller/Zerlinda collaboration sees the much-anticipated release of their ‘Hammer Of The Gods’ EP in an edition of 500 copies. Not only that, the original members have now reunited and are busily working on some genuinely excellent new material, so heres hoping the next offering from Burner is a full-length album! SKU: YP-2312 Categories: All Genres, NWOBHM, Search by Media Type, 7", 7" Normal Discs, NWOBHM 7"